At Esparto Community Services District, our goal is to provide safe, clean, sparkling water to all our residents! 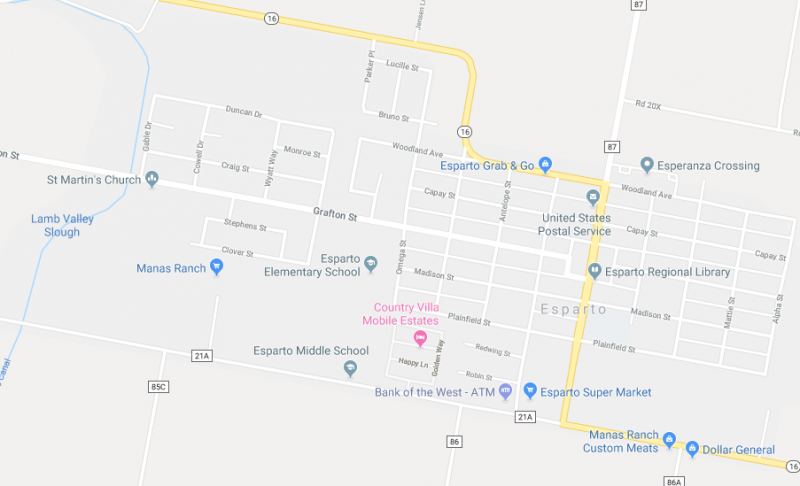 The Esparto Community Services District was originally formed May 12, 1960 and was called the Esparto Sanitary District. The original board members were Fred Storz, Robert Keisler, Don Warren, Joseph T. Lindberg and Louis Giminez. On September 12, 1961, the board approved the purchase of 20 acres for the first sewer ponding area for $20,000. The first employee of the district was William Lee Findley, who began working for the district on July 9, 1962. Comply with all state and local mandated water and sewer rules and regulations. We are extremely proud of our accomplishments and commitment to provide the best possible service to our community and customers. Below is a photo of our current service area.